3D Pink Car Soap - 1 gal. 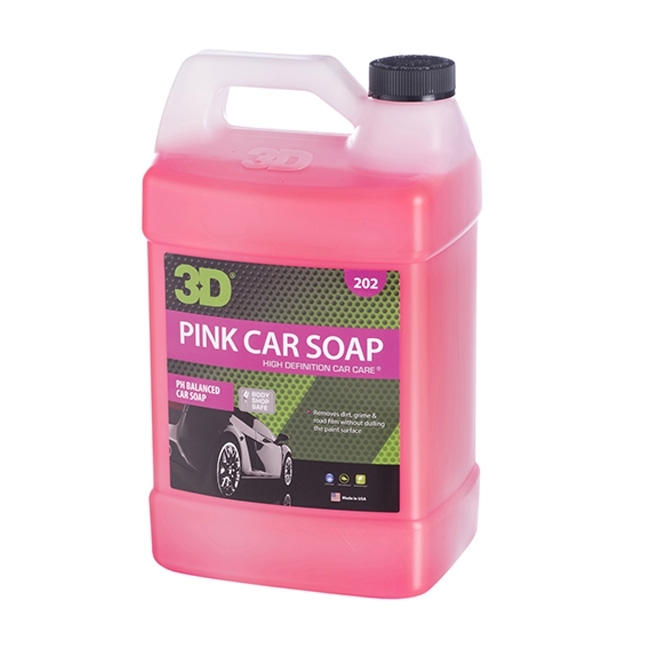 3D Pink Car Soap is a car wash product that can be used with a foamer It can also be used out of a bucket. When you're using soaps check out three things that are very important. The first is going to be wash-ability. Second is going to be foam-ability and the third thing is rinse-ability. We have all the key steps involved with this product so it will be easy to wash. It will be easy to use with the soap and rinse off. Apply 1 ounce of Pink Car Soap to 1 gallon of water. Spray pressurized blast of water into your wash bucket to produce suds. Carefully wash vehicle with your favorite wash sponge or mitt from top to bottom constantly applying fresh suds to each panel and flushing your mitt/sponge of trapped dirt particles. Avoid allowing shampoo to dry on vehicle. Rinse frequently. Gently dry the vehicle with soft microfiber towels immediately after final rinse to prevent water spots. Avoid washing in direct sunlight or when your vehicle surface is hot. Meguiar's Shampoo Plus, D11101 - 1 gal. 3D Pink Car Soap - 16 oz.